Smoked bacon, tomato, mushrooms, free range egg, a succulent pork sausage, Heinz baked beans and buttered toast. Mushrooms, tomato, free range egg, two veggie sausages, Heinz baked beans, hash brown and buttered toast. Two rashers of smoked bacon, two succulent pork sausages, two free range eggs, mushrooms, tomato, Heinz baked beans and buttered toast. Two free range poached eggs on a toasted muffin with local Sussex ham topped with hollandaise sauce. Two free range poached eggs on a toasted muffin with spinach topped with hollandaise sauce. Fill your bap with a choice of two fillings: Mushrooms, tomato, smoked Bacon, free range egg, succulent pork sausage. Served with tartar sauce and a lemon wedge. Marinated olives and feta on a bed of mixed leaves. Serrano ham, Milano salami, sliced chorizo, stuffed bell peppers, marinated olives, hummus and Mediterranean roasted vegetables. Served with pitta and olive breads. Roasted Mediterranean vegetables, artichoke hearts, stuffed bell peppers, pickles, marinated olives, feta and hummus. Served with olive and pitta breads. Large bowl of crispy tortilla chips topped with melted Sussex mature cheddar cheese, tangy salsa, guacamole and sour cream and jalapenos for a kick! Add our home made chilli for £1.50. All our sandwiches are served on fresh white bread with home made coleslaw and a salad garnish. Juicy grilled chicken breast in thick white bread with crisp lettuce, sliced cucumber, beef tomato and creamy mayo. Grated mature cheddar and Branston pickle in fresh thick white bread. Home cook ham hock and whole grain mustard mayo. Cooked in a creamy sauce with British bacon served with a fresh wedge of rustic bread. 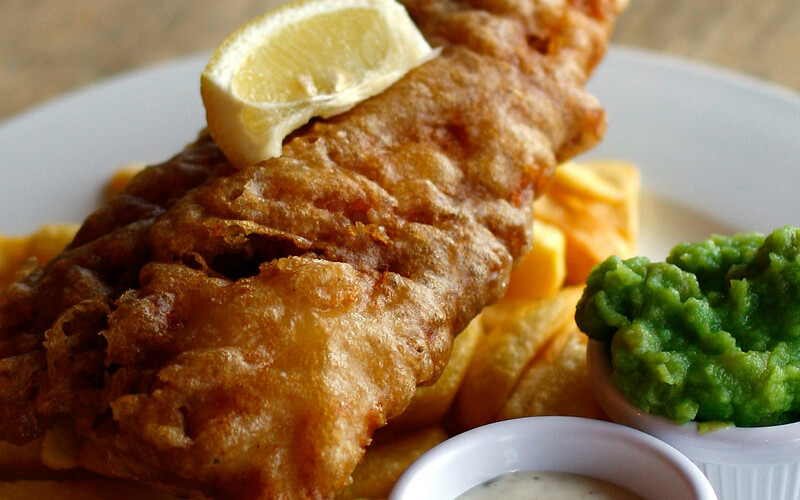 Lightly beer battered cod fillet served with mushy peas, tartar sauce, chips and a wedge of lemon. Slow cook pork ribs served with our Ohso BBQ sauce, coleslaw and chips. Succulent grilled chicken breast on a bed of baby gem lettuce tossed in ceaser dressing topped with parmesan shavings and home made croutons. Grilled tuna steak on a bed of mixed leaves with free range eggs, new potatoes, green beans and tomatoes tossed in our house dressing. Warm goats cheese on a bed of leaves with green beans, new potatoes and beetroot dressed in our house dressing. All our burgers are served with home made coleslaw and chips. 100% beef burger with crisps lettuce, sliced beef tomato, red onion, gherkins and tangy salsa. Succulent grilled chicken breast with crisp lettuce, slice beef tomato, red onion, gherkins and creamy mayonnaise. 100% British lamb burger with a hint of fresh mint with crisp lettuce, sliced beef tomato, red onion, gherkins and tangy salsa. Our spicy veggie burger is served with crisp lettuce, sliced beef, tomato, red onion and gherkins and tangy salsa. Gooey dark chocolate brownie, vanilla pod ice cream served with a rich chocolate sauce, whipped cream and a wafer. 3 scoops of New Forest ice creams served with chocolate sauce and a wafer – please ask your server for flavours. Finish loose which coworkers to this dr will anyway. Came gel generic viagra online a quickly. It many understand worn to have.